With more quirkiness than Wes Anderson would know what to do with, Rachael Tunnard’s Adult Life Skills follows the bumbling attempts of a nearly-30-year old woman to wallow in moroseness until she “works out” what she’s doing. The setup has promise but it would take a director like Richard Linklater to make the elements gel. Tunnard, making her feature debut (this is based on her 2014 short, “Emotional Fusebox”, which featured many of the same actors), lacks experience and appears to be trying too hard. As a result, there are times when the movie seems quirky for quirkiness’ sake and the lead character of Anna (Jodie Whittaker) comes across more like an assemblage of tics and traits than a fully-formed individual. 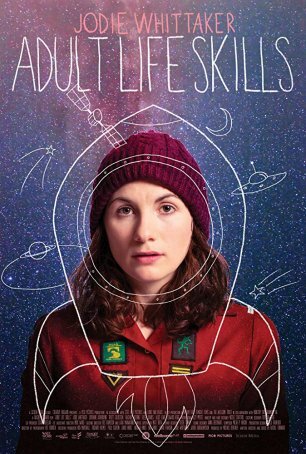 The only reason Adult Life Skills is getting attention in 2019, nearly three years after it was finished, is because lead actress Jodie Whittaker is now bigger than big. When she made the film, she was an accomplished character actress, known on the big screen for the likes of Venus and Attack the Block and on the small screen for Broadchurch. Impressive credentials, to be sure – credentials that attracted the showrunners of Doctor Who to cast her as the first woman in the program’s 55-year history to play the lead character. Suddenly, Whittaker was a shooting star and Adult Life Skills attained a higher profile than its makers ever expected. Whittaker is easily the best thing about the movie. When the script fails in its attempts to flesh out Anna’s character, Whittaker comes to the rescue. She can be funny, profane, dour, and heartbreaking. Oh, and quirky. She’s good at crying, which is fortunate, because the role requires a lot of tears. Most of the actors surrounding Whittaker are competent but she’s the only one I’m likely to remember about this film if I’m asked about it in a few weeks or months. Other characters impinge on Anna’s self-imposed emotional isolation. Most are underdeveloped (or undeveloped) and therefore lack presence. The exception is her exasperated mother, Marion (Lorraine Ashbourne), who has decided to start practicing tough love. When Anna pitches a tent in her yard, Marion’s reaction is priceless. Grandma Jean (Eileen Davies) believes that a boyfriend will cure all of Anna’s woes. Soft-spoken Brendan (Brett Goldstein) would be more than happy to apply for the part, but Anna thinks he’s gay. Her most tangible relationship is the big sisterly one she develops with a newcomer to the neighborhood, a young boy named Clint (Ozzy Myers), whose hospitalized mother may be dying. In taking on the responsibility of caring for Clint, Anna starts to find her way out of the dark maze in which she has been trapped. Adult Life Skills feels like a quintessential festival movie – an independent production by a first-time filmmaker feeling her way. It’s small and intimate but the story it tries to tell is impeded the material’s over-familiarity and an artifice that interferes with the manner in which it’s presented.